55% of voters say that in the past several weeks they haven’t seen a boost to their paycheck as a result of the tax law. 22% said they have seen a paycheck boost, compared with 27% who said the same in early March. 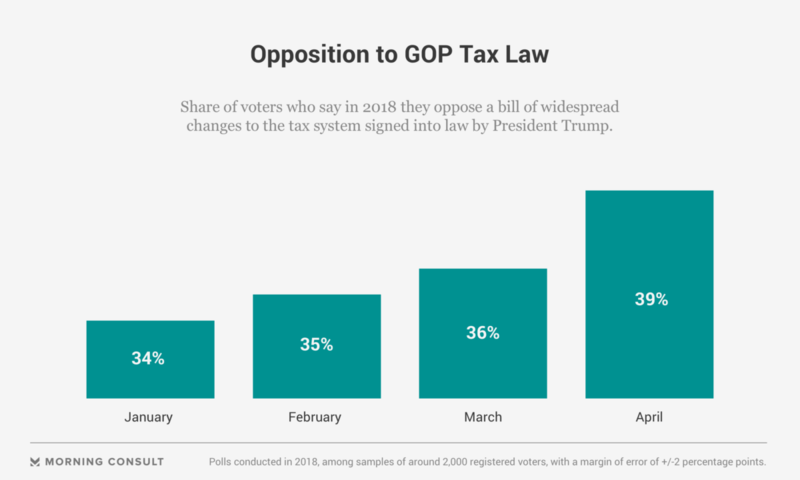 39% of voters oppose the tax law, up from 35% in January. The number of voters reporting paycheck increases as a result of the tax law Republicans enacted in December has declined in recent weeks, according to a new poll that also shows increased opposition to the revised tax code. Fifty-five percent of the 1,993 registered voters surveyed in a Morning Consult/Politico poll conducted April 19-23 said they have not noticed a boost to their paychecks in the last several weeks because of the tax overhaul, while 22 percent said they have seen an increase and 23 percent said they didn’t know. A similar March 1-5 poll found that 27 percent said their paychecks had increased, compared with 50 percent who said they had not and 23 percent who didn’t know. Overall support for the law has declined, with 44 percent saying they either strongly or somewhat back the tax overhaul, compared to 46 percent who said the same in March. Both polls have a margin of error of plus or minus 2 percentage points. Thirty-nine percent in the most recent survey said they either strongly or somewhat oppose the law. That compares with 36 percent in March, 35 percent in Feb. 15-19 poll and 34 percent in a Jan. 11-16 survey. President Donald Trump signed into law the legislation, which no congressional Democrats supported, on Dec. 22, 2017. The tax code rewrite eliminates most itemized personal deductions while expanding the standard deduction. Its centerpiece is a corporate tax rate cut to 21 percent from the previous top rate of 35 percent. Republicans who supported the measure say that slashing the corporate rate will spur domestic investment, leading to benefits that U.S. workers will see in their paychecks. Shortly after the law was enacted, some companies gave raises or bonuses to employees and attributed their actions to the corporate tax cut. The GOP has seized on compensation actions attributed to the tax law, and the party has said the law will play a major role in the congressional midterm elections in November. Grover Norquist, president of the right-leaning Americans for Tax Reform, said in a Monday interview that he expects estimates of stronger economic growth, and that more voters will notice lower taxes on their pay stubs as the year progresses — which could benefit Republican candidates in the midterms. In March, employers added 103,000 jobs, compared to a gain of 326,000 the previous month, according to the Labor Department, while the latest Commerce Department figures show the U.S. economy grew at an annual rate of 2.9 percent in the last three months of 2017 after expanding at a 3.2 percent pace in the third quarter. Average hourly earnings increased 0.4 percent in March following a 0.1 percent dip in February and a 0.3 percent decline in January, according to Labor Department data. Democrats have said the tax law, in particular the corporate tax cut, is a giveaway to corporations and the wealthy that will have negative long-term effects on the U.S. economy. Projections from the nonpartisan Congressional Budget Office and Joint Committee on Taxation estimate the law will add at least $1 trillion to the national debt over a 10-year period. Some Democrats say the diminished federal revenues during that period could force cuts to major services and social insurance programs. Jacob Leibenluft, executive vice president for policy at the left-leaning Center for American Progress, said in a Tuesday interview that he expects voters will recognize those potential long-term hazards and understand that wage increases could be attributable to strong economic growth rather than the tax law. “Even if they’re experiencing a short-term benefit, people see it as small relative to people who are much better off,” Leibenluft said.